The San Francisco Basque Cultural Center is a gathering place for Basques from Northern California and beyond (Biltzen). The center features a very popular restaurant that is open to the public, and a large indoor hand ball court. California Basques date back to the arrival of the very first Europeans. In 1776 Juan Bautista de Anza chose the site for the area that would become San Francisco. The San Francisco Basque Cultural Center opened in 1982. For more about the early history of the Basque Cultural Center click here. For more information on The Basque Country click here. Unless expressly stated otherwise, the interpretations, conclusions expressed or inferred in the materials on this site do not necessarily represent the views of the San Francisco Basque Cultural Center, Inc.
"Gabriel’s Message” or "The angel Gabriel from heaven came” is a Basque Christmas folk carol. Its theme is the Annunciation to the Virgin Mary by the archangel Gabriel that she would become the mother of Jesus Christ the Son of God. The original name of the song in basque language is "Birjina gaztetto bat zegoen”. The song was collected by Charles Bordes and then paraphrased into English by Sabine Baring-Gould. Photos from the Gaelic Zati Bat event this past November 9th. On Egin! 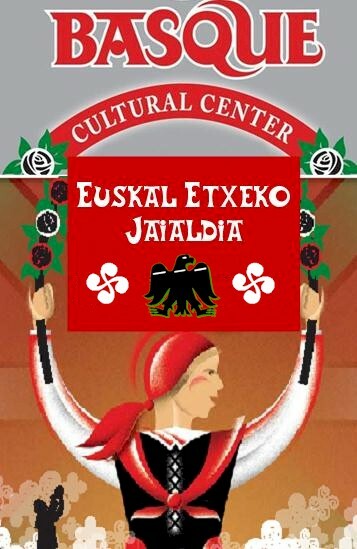 BASQUE CULTURAL DAY - Saturday, November 9th. Click here to hear the March edition of the 8HZ Radio show with Aita Cachenaut.